Where you place the origins of pasta depends a great deal on how you define it. There is evidence that the ancient Etruscans prepared a wheat and egg paste, but it was baked not boiled. Does that count? There are artifacts from a period 3,000 years ago that look remarkably like pasta dies and extruders. But naturally the material they worked on is not preserved. Certainly the ancient Greeks had some form of flattened dough that resembles lasagna. The knowledge to mix wheat and egg with water was known long before. But the result was roasted on hot stones. Whether this should be called 'baking' is a matter of semantics. The Romans quickly followed suit in the 1st century AD with a layered dish comprised of 'lasagna' and meat or fish. By the 5th century AD, cooking noodles was commonplace, as is known by references from the Talmud. This record of pasta-like preparation in Arab lands provides a basis for the claim that the practice spread to Italy from Arabia. With the incursion of Arabs into Sicily, they would undoubtedly have brought a food that could travel well. A flour-based product in the shape of strings was produced in Palermo at the time that might fit the bill. While for a time it was thought that Marco Polo returned from China in 1295 with pasta, there are Italian recipe books from twenty years earlier containing references to pasta dishes. However, it is certain that he did encounter pasta on his travels. Since China is an ancient civilization, with a complex culture dating back 5,000 years, it's likely that pasta existed in China very early. Nevertheless, pasta did become more popular during the 14th century and spread to the 'New World' as Italian and Spanish explorers sailed the seas to new lands. In the 'Old World' it continued to spread, with tubes of pasta in use at 15th century Italian monasteries. By the 17th century, it was a common food throughout the region. In the New World, pasta grew in popularity through the 18th century. By its end, it graced the table of Thomas Jefferson and commoner alike. When the American Ambassador returned from France in 1789 he brought with him a maccaroni maker that he used to delight friends. Macaroni and cheese was enjoyed by many during the period of the Civil war in the mid-19th century (1859-1864), owing to its ease of storage and cooking, along with the satisfying taste. But it was with the large Italian immigration around the turn of the century that pasta really took off in America. Spaghetti, lasagna and a great many other forms became widespread as a result. With the ubiquitous consumption of pre-made dried macaroni and cheese during WWII, the dish became a staple of the American diet for decades after. But whatever its true origins, and subsequent history, one thing is sure. Pasta is here to stay. One of the most remarkable things about pasta isn't just how long it's been around. It's that, plus the fact that it has changed so little over the hundreds, or perhaps thousands of years that it has been made and consumed. 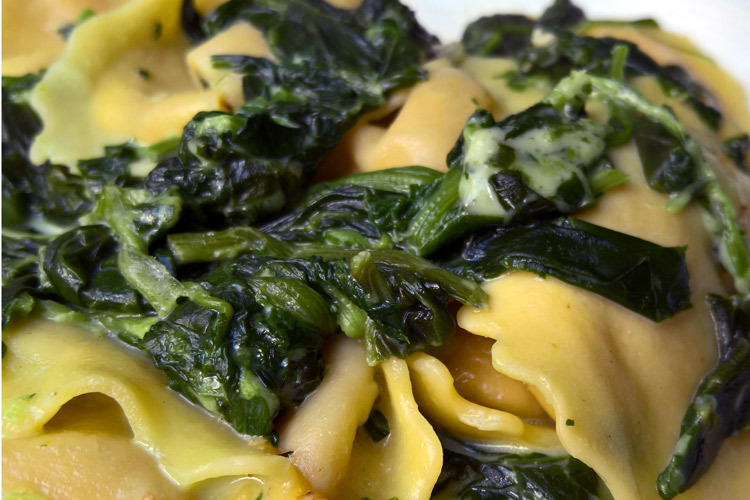 While the ancient Greeks and Romans undoubtedly made and prepared pasta differently than is done now, dishes made during the Renaissance would be easily recognizable today. Any food which can satisfy and remain relatively unchanged for 500 years surely has some remarkable properties. Made from simple ingredients - wheat and eggs - and processed in a simple way - just basic mixing - are just two reasons, but fundamental ones. Healthy, appetizing and easy to prepare by simple boiling or baking are other attributes that are equally important. The many shapes and sizes of pasta aren't just a modern marketing gimmick, either. They serve a good purpose. Providing lots of surface area on this starchy food allows sauces to cling well. Coming in a variety of useful shapes means the ability to stuff, layer or otherwise offer versatility in recipe invention. Pasta, almost alone among foods, goes well with a huge variety of other ingredients. Everything from bacon and steak to asparagus and peas can be part of a great pasta recipe. The range of compatible sauces, from simple marinara to a fine clam, is unequaled in other foods. And, how many foods can serve superlatively in such a wide assortment of recipes both cold and hot? Pasta is a very healthy food, too. Despite its reputation, pasta is a low-calorie, heart-beneficial dish. With only 200 calories per cup (two servings) and a gram of fat, it is perfect even for those on a strict diet. As a complex carbohydrate, it is digested slowly, leading to an even and gradual production of blood sugar. As a food high in fiber, there is evidence that it is helpful in forestalling intestinal and other cancers. Often fortified with folates and naturally packed with essential minerals, it is heart-healthy, as well. It's easy to prepare, easy to cook and makes for a great presentation on the table. There's a good reason so many Italian restaurants continue to do good business. But it's equally welcomed at home where it can inexpensively feed a family of five or a party of fifty. But one thing about pasta has changed dramatically over the centuries. There are today more helpful tools and machines to create and prepare pasta than ever before. The variety and utility of rollers, cutters, bowls and other tools is greater than ever. Materials science and ergonomic designs have made these things stronger, healthier and less expensive. Pasta making machines are cheaper, more reliable and come with a larger assortment of useful attachments than they did even as recently as twenty years ago. So when you think of pasta, you don't need to think of a "food you really shouldn't eat" or one that is just mundane. It's healthy, can be prepared in a dazzling array of tasty dishes, and is just plain great. Pasta has evolved from Italian food, or Oriental food, to food for the world. Learn how to cook pasta, including pasta salads. Don't forget that, for pasta, the sauce makes the dish.